Stunned scientists announced Wednesday the unexpected discovery of large quantities of oxygen on a comet which streaked past the Sun in August with a European spacecraft in tow. The find came as a “big surprise”, and challenges mainstream theories on the formation of our Solar System, said scientist Andre Bieler of the University of Michigan. Measurements made by the Rosetta probe suggested that oxygen molecules in the 67P comet’s gassy halo must have existed “before or at” its formation, he told journalists. This may have implications for mankind’s understanding of the chemistry involved in the formation of the Solar System some 4.6 billion years ago. “We believe this oxygen is primordial, which means it is older than our Solar System,” said Bieler. Scientists had previously ruled out the presence of oxygen (O2) on comets such as 67P/Churyumov-Gerasimenko, the subject of intensive prodding and probing by a European robot lab. As O2 mixes easily with other elements, “we never thought that oxygen could ‘survive’ for billions of years” in a pristine state, said Kathrin Altwegg of the University of Bern, who co-authored a study in the journal Nature. “This evidence of oxygen as an ancient substance will likely discredit some theoretical models of the formation of our Solar System,” she said. 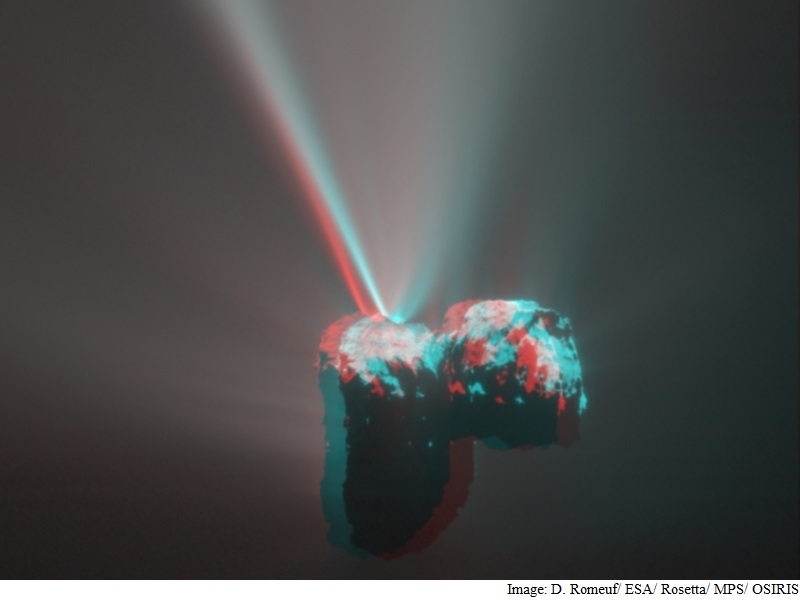 The comet is being tracked on its deep space journey around the Sun by the European Space Agency’s Rosetta spacecraft. The historic mission seeks to unlock the mystery of the origins of life on Earth. Scientists believe that comets “seeded” early Earth with some of the ingredients for life. The team monitored the ratio of oxygen to water on the comet for several months to see if the gas molecules would dissipate as solar winds ripped away layers of surface. They did not – proving the oxygen was embedded in the comet, not just hanging around its surface. Prevailing theories of the Solar System’s birth posit a chaotic, collision-strewn mixing of matter flowing toward and away from the newly-formed Sun. Pristine, icy grains containing oxygen would not have made it through such violence intact, the scientists said, leading them to speculate that the process was, in fact, “gentler”. The oxygen molecules must have “survived from the dark molecular clouds from which they were probably formed into comets as we have them today,” said Altwegg. Only twice before – on the icy moons of Jupiter and Saturn – have oxygen molecules been found in the Solar System beyond Earth’s atmosphere, and never before on a comet. Oxygen is difficult to detect with Earth-bound telescopes. Rosetta offered a rare opportunity to study 67P’s “coma” – the envelope of dust, gas and ice that forms as it nears the Sun on an elliptical orbit. The new data suggests that water on comets is probably the rule rather than the exception, the scientists said. Scientists not involved in this study underlined its importance, but said more time was needed to assess the implications. The discovery “imposes a severe constraint on the mechanism for the formation of the Solar System,” said French astrophysicist Francis Rocard. “But we shouldn’t jump to conclusions,” he cautioned. Oxygen molecules were the fourth-most common gas detected in 67P’s debris halo – after water, carbon monoxide and carbon dioxide. Their presence did not tell us anything about the origins of life on Earth, of the possibility of finding it elsewhere in the universe, Altwegg said. In looking at exo-planets, “the combination of O2 and methane has been taken as a sign that you might have life underneath,” she said.